Anti-reflective coating is applied to most lenses, eyeglass lenses, lasers, and objectives, however this coating only functions optimally within a narrow wavelength range. 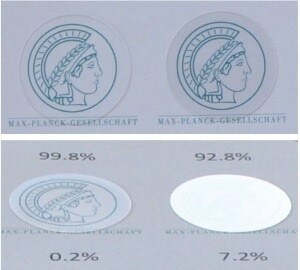 A research team at the Max Planck Institute for Intelligent Systems in Stuttgart has developed an alternative technology by manipulating the surface instead of coating it. In comparison to conventional processes, this offers the preferred anti-reflective effect across a broader wavelength range. In addition to this it enhances the light transmittance through surfaces. It is possible that the nanostructured surfaces may optimize touchscreens, high-energy lasers, and the output of solar modules in the future. The team borrowed ideas from the design book for moth cornea. The corneas of these typically nocturnal insects reflect nearly no incoming light. The moth’s presence is not betrayed to potential predators as there is no glow of light bouncing off their eyes. Less reflected light means that moths can use almost all the limited night-time light to see. Nature’s magic inspired the researchers to try the same concepts to design optical components. Similar to the corneas of moths, the components have to allow light to pass through while light reflection is of little use. Component engineers apply anti-reflective coating to lenses, monitors, display screens, and laser parts. But these coatings possess certain disadvantages. Many of them only function in a narrow wavelength range, and they cause lens errors according to the angle of light incidence. Using the moth cornea concept will solve these issues. The research team at the Max Planck Institute for Intelligent Systems, Department for New Materials and Biosystems, led by Director Joachim Spatz, analyzed their natural model closely. The eye surface is densely covered with column-like structures. They are only a few hundred nanometres high and taper conically toward the tip. The columns resemble commonly spaced stalagmites found on a cavern floor. As the light passes via this boundary layer, its refractive index alters constantly, beginning from the ambient air to the materials of the outer moth eye layers. This steady refractive index alteration has the effect that the layer barely reflects any of the incoming light. Instead, nearly all of incoming light enters into the eye. In contrast, when incoming light contacts a smooth surface, the refractive index will alter suddenly. According to the laws of physics, this will produce light reflection. Diao adds another crucial precondition: "To make the system work, the distances between individual columns must be significantly smaller than the wavelength of the incoming light." To mimic the moth eye concept, the team had to develop a way of converting smooth surfaces into nano-column landscapes. To achieve this they created a two-step procedure. In the first step, they placed gold particles in a standard honeycomb pattern on a large surface. In this standard honeycomb pattern, the gold particles accumulate in the crossroad junction. In the second step, the gold-studded crossroads act as mask in a chemical etching method. Consequently, no material is etched away beneath the gold-studded crossroads, and the preferred upright column-like structures stay untouched. The structured surfaces covered as much as two by two centimeters. This technique secured the first successes in the past, but it has so far only worked for visible light and short wave UV radiation. However, the same did not apply for the longer wavelengths of near infrared light (NIR). The reason for this was the column size. Until then, the columns etched out of the surface were about 500 nm high. The columns are not high enough to attain the 99.5% or higher light transmittance for the wavelengths in the NIR range. The longer the light waves, the higher we must build the nanostructures. The research team fine-tuned their processes and discovered a way to enhance the size of the deposited gold particles. "This made it possible for us to etch deeper into the material", reports Diao. Now, the researchers are able to etch out columns as tall as 2,000 nm or 2 μm, four times as tall as before. The new methods also allow the researchers to control the shape of the nano-columns. They manipulate the way the columns taper from the bottom to the top and how they are narrow on the top. Through this process, they figured out that uniformly tapered columns will allow the highest transmittance rates. The researchers tested this with several column heights and verified that they realized the best transmittance values for various wavelengths with varying heights they made the columns. For 1.95 μm high columns, the highest transmittance was 99.8%, noticeably in the NIR at about 2.4 μm. With growing column height the range of wavelengths with high transmittance broadened. For 1.95 μm high column layers, the high transmittance rates of 99.5% or higher covered approximately 450 nm of the spectrum. In the case of smaller column structures, the high-transmittance was about 250 nm wide. High transmittance rates with a highly reduced light reflection are the foundation for potential 'stealth applications' as the surface-treated materials are optically impossible to tell apart from their environment. After column etching a piece of quartz glass, the outlines of the piece could not be seen, and a camera could not capture it. But when the Max Planck team covered an image with a quartz glass piece with column-studded surface, the image remained visible even if observed from an acute angle and from the upper edge. In contrast, quartz glass with unchanged surface reflected the incoming light so much that people could no longer distinguish anything at an angle of 30°. In the initial experimental phase, the researchers used quartz glass to test their hypotheses. Future plans will involve testing the methods on sapphires and optical lenses. Immediately after the methods are proven to be applicable to the new materials, the team will be eager to test many potential applications. Several applications could benefit from the use of components with nearly no reflection across a broad range of wavelengths and up to 99.8% transmittance of incoming light. "One important field would be high-energy lasers operating in the infra-red range“, asserts Diao. Particularly in certain laser systems, in which the light is amplified while it passes through the same optical parts repeatedly, small losses due to reflection will add up to obvious energy losses. Twenty three percent of the energy will be lost after the same light beam hits the same boundary fifty times at a transmittance of 99.5 per cent. At 99.8% transmittance, the total energy loss after 50 passages would be just 10%. In field tests, the nanostructured surfaces are more flexible against the high laser energy than anti-reflective coatings. This is another benefit especially for laser applications. Other practical applications could be lenses, touchscreens, or objectives. Nanostructured surfaces provide yet another benefit. Diao points out: "The technique is not only suitable for level, but also for curved surfaces.”That would be advantageous in particular for microscope or camera lenses. Before the method can help to progress touchscreens, a solution has to be found for the issue of contamination because of touch. Experiments have revealed that touch by human hands will leave noticeable traces. After a while, this will critically impair the surface and cause considerably reduced transmittance. On a positive note, the researchers were also able to demonstrate how easily touchscreen users can get rid of such contamination as easy as from a glass surface using a little laboratory alcohol. However, for touchscreen applications, the team hopes to find a better solution.